Hennecke occupies one of the most sought-after positions in the rankings of the University of St. Gallen and the magazine “Wirtschaftswoche”, positioning the company as the global market leader of its sector. But being the global number one in plant and process technology for polyurethane processing demands more than just continuous innovation or development capacity. Rather, the focus is on concrete product implementation, because only practical solutions serve global production needs. STREAMLINE processing systems are a brilliant example of such a success story. With the new “MK2” generation, Hennecke is giving significant further development to the efficient high-pressure metering machines for HP-RTM and CLEARRIM/clearmelt® applications with the experience of dozens of production systems and preliminary product developments. Building on the sale of over 70 STREAMLINE machines in the first generation, developers, manufacturers and raw material suppliers have been able, in many ways crucially, to develop a variety of processes in the manufacture of fibre-reinforced structural components (HP-RTM technology) and in efficient surface finishing using polyurethane and polyurea coating (CLEARRIM and clearmelt® technology), leading to diverse serial applications. Not only is Hennecke proud to launch the first series production of an HP RTM component with the development of a composite leaf spring, but also to be one of the pioneers of this kind of innovative production process. Particularly in the area of HP RTM applications, the STREAMLINE has become an industry standard around the globe, which is characterized by the fact that around 40 series applications are now successfully using this established machine system. The process expertise and wide-ranging experience gained from consultations with development partners, customers and raw material suppliers now form the basis of the machine configuration for the new STREAMLINE MK2 – a fundamentally new generation of machine which has been developed in line with current market demands. While the focus of the market launch of HP-RTM technology was still largely on research and development equipment, which was primarily used to design components for serial production, producers are now increasingly asking for standardized machines with high requirements in terms of availability, service and maintenance. As many of the newly developed products have since entered mass production, this market trend is a logical consequence of the successful development activities. The MK2 provides Hennecke customers with a highly developed product, precisely adapted to the process availability of serial applications in HP-RTM, CLEARRIM and clearmelt® processes. The second STREAMLINE generation offers further impressive benefits. Production flexibility increases considerably thanks to the ultra-space-saving layout of the machine on a frame which is mobile and can also be lifted by crane. The plant automation is also particularly flexible: The STREAMLINE MK2 is equipped with a wireless operator panel, which implements a location-independent operation of all process parameters on the spot. The efficient heating configuration is impressive in terms of innovative detailed solutions: the heating and metering cabins are joined together using quick-locking mechanisms which allow for easy dismantling at any time. This ensures that all main components such as the high-pressure pumps can be exchanged very quickly. In good timing for this year’s leading composite trade fairs in Shanghai, Dallas, Stuttgart, Seoul und Tokyo, Hennecke experts will be presenting the second generation of STREAMLINE to the international trade audience. The new STREAMLINE MK2 will begin delivery as of January 2019. 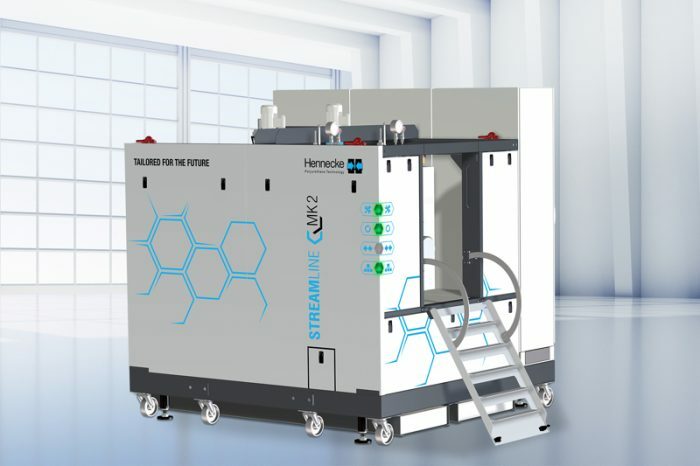 In connection with the product launch of the STREAMLINE MK2, Hennecke is following a great tradition, in which machines are brought onto the market by industry partners before the official sales start. For more information, please visit http://www.hennecke.com.